Ballyclare is a UK supplier of high quality workwear. Stocking a huge range of high quality work, safety and industrial clothing for multiple market sectors including catering, police, fire, military, automotive, and more. 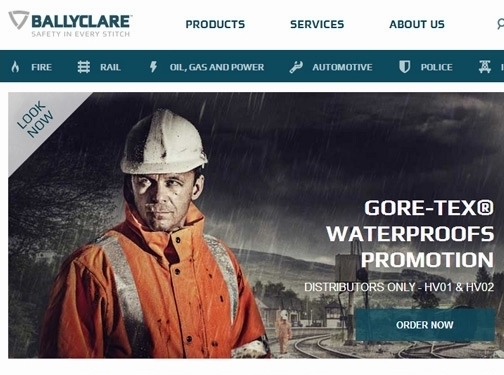 Ballyclare Limited is a British based designer, manufacturer and distributor of only the highest quality protective clothing, specialist PPE equipment and hardworking and functional workwear. We are a specialist and trusted producer of structural and specialist firefighting protective clothing and kit for the emergency services and armed forces. We also provide managed services including industrial garment leasing, supply, laundering and garment repair. We combine our extensive experience and knowledge garnered across this wide range of different sectors, meaning that you can trust Ballyclare to offer you only the highest quality protective workwear available in the UK. We fulfil all orders, whether you require just one article or to equip your entire workforce. UK based (HQ'd in Stockport) business - established over 100 years ago - providing workwear for sale. Website includes e-commerce facilities, delivery and returns information, "meet the team" page, terms and conditions, accreditations, testimonials, full contact details including company registration details. Company has received Royal Warrant for the supply of Specialist Fire Protective Clothing By Appointment to Her Majesty The Queen.